This is Bob’s trusty snow blower. See how nicely it is sitting there in front of the garage doors? This is my snow blower. See how it is working and moving the snow. 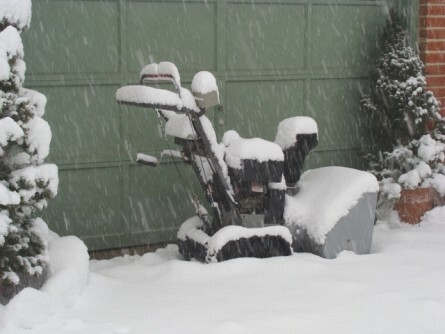 Poor Bob, his snow blower broke down in the middle of the biggest storm we have ever seen. He spent the day shoveling snow and it is still coming down. Bob grew up with a short driveway and so it seems to him that our driveway is long. Maybe it is 100 feet. I grew up with a long driveway maybe 1500 feet. 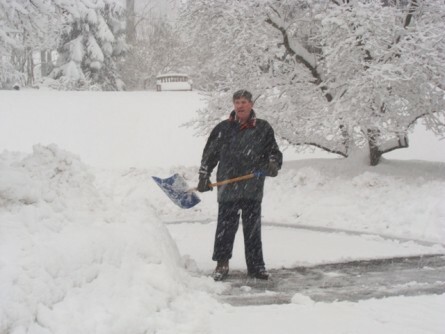 We didn’t have snow blowers or plows, hell, we barely had shovels. What we did have was lots of kids. My dad would send us outside and we would stand shoulder to shoulder and push our shovels in unison down the driveway, like a team of mules. He was the director of this operation. He was like the big fat guy who stands on the side of the road watching and pointing to the guys digging the ditch. It was very effective unless someone fell out of line and then the whole system unraveled. The older kids didn’t want to stop and wait for the little kids to catch up, the lines got wavy, snow was left in clumps and we had to start all over with a lot of shoving and pushing and ultimatley a snow ball fight which always ended in tears. AHH the good old days. So needless to say I was not involved in the snow shoveling operation today. Just not my thing! I sent in my pinch hitter, Ali. 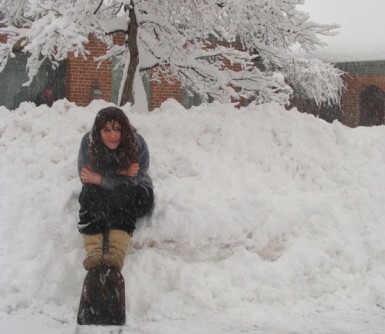 It would appear that she should have parked herself over by Bob’s snow blower. And why did her mother let her outside without a hat, gloves or coat?